Lesley Morrissey is an expert in readability and a professional copywriter. She has worked for leading advertising agencies such as J Walter Thompson and BBDO. She has recently published her first eBook, How to Market your Business Better in 30 Days. Targeting your message – learn to focus on what your message is and who your audience are. Writing for the web – how to utilise your website effectively to promote your product and services. Understanding the needs and habits of your readers. Core writing skills – Key skills for professional writing, understanding the use of language, the first person and editing. Article marketing and Blogging – using writing as an effective way to market your business. Article marketing is quickly becoming a key are of Internet marketing and search engine optimisation. Online marketing – This is all about social media and microblogging. What is it, how to do it effectively. Writing for the media – Some powerful tips to help you get your message spread to the mainstream media. This can be far more powerful than social media or SEO when it is done well. Although this book is called How to market your business better in 30 days it is clearly a long-term strategy that Lesley is providing here. She delves into years of experience working for leading marketing agencies to provide you with an action plan and many trade secrets into how to market your business better. Lesley introduces the book with some examples of mistakes that she made – mistakes I have also made – such as printing postcards and never distributing them, starting unfocused campaigns and networking without creating leads and opportunities. The book then goes on to teach how to get some quality website assessments done without paying out to a professional web design agency. The advice on writing is spot on. It covers the basics, such as always writing for your reader (“you”) and not for us (“we”). A simple change in writing style can make your readers feel that the message is being targeted towards them and this makes you them feel important. This section discusses the importance of a website’s navigation to help your readers to find exactly what they are looking for. Really this is a topic which requires a lot more depth but Lesley covers the basics nicely. This is an interesting section as it gives some great advice on writing direct mail campaigns which actually draw a reader in. How to make cold calling / mailing seem personal and inviting. If you have never done any article marketing this is a good place to start. Lesley shares some popular article marketing websites, however, she misses out some newer and more powerful options. Article marketing is an area which is undergoing a lot of changes, especially since Google rolled out its Panda updates. There are some good solid tips on writing blogs to help promote your business. For years people have been saying “you must have a blog on your website to get more traffic from Google”, which has resulted in thousands of blogs appearing on sites that have no useful or interesting content published on them. A blog is only useful if it is well maintained! The advice here is mostly about time – you need to plan and dedicate time to do marketing well. There are many ways to increase productivity, and tools for achieving this are discussed, but you still need to dedicate some real solid time to marketing your services online. The last main section is on social media and micro blogging. This is really the online equivalent of word of mouth marketing. Many people get social media wrong and create spammy profiles and try to force their services on to others. The key to successful social media campaigns is to encourage your “audience”, or more specifically your community and network, to do the marketing for you. Lesley goes on to talk about newsletters, another often forgotten art. A good newsletter can engage your audience and remind them that you are still there trading. People are forgetful. If they sign up to your newsletter it is because they want news – so send them news! She finishes with some good advice in writing press releases and learning to promote every success that you or your business has. Overall this is an excellent introduction to marketing. Lesley writes in a way that is easy to understand. There is no complex marketing jargon. It is written for people totally new to marketing and also provides some great tips for people who have been doing their own marketing for a few years. 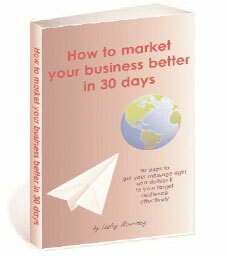 Lesley’s eBook is only available from her website; www.lesleywriter.com/how-to-market-your-business-better-in-30-days.